Sources: Tim Barlass, senior writer for the Sun-Herald, Richard Noone, Central Coast Gosford Express Advocate and Cathy Cole, historian for the Terrigal Surf Lifesaving Club. 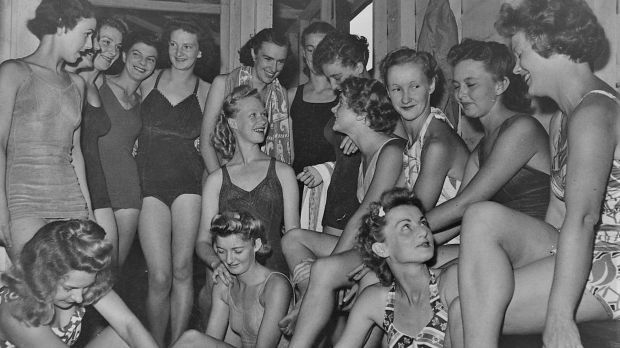 Cathy Cole, from the Terrigal Surf Life Saving Club has researched archived newspaper reports from the 1940s to identify the women and uncover their extraordinary story. During the WW11, the Surf Lifesaving Association of Australia found its ability to provide beach rescue stretched so the ladies of Terrigal Surf Lifesaving Club asked permission to become lifesavers because only four of its original 76 male members were available. They were trained by chief instructor Harry Vickery before being assessed by Central Coast Life Saving’s inaugural president Dr E.A. Martin. An accredited member of the board of examiners since 1933, Dr Martin told a newspaper at the time he adjudicated a simulated rescue and resuscitation exam. “Their discipline and beach work were excellent and at least equal to any Bronze Medallion squad I have ever examined,” he said. Despite his glowing endorsement, Ms Cole said, SLSA refused to award them Bronze Medallions or acknowledge their patrols. The women faced ­enormous community and social resistance. “There was resistance – people did not like being told what to do by a woman,” Ms Cole said. In two exams, some 30 Gosford young women qualified for the equivalent of the bronze medallion and received certificates on Terrigal beach but they were never awarded their medals. Though their application to the controlling body failed, they were not about to let that get in their way and they went on to patrol Terrigal for the summer seasons making their own swimmers and uniforms out of sheets, curtains and even a parachute­. A group photo of the women of the Terrigal Surf Lifesaving Club. One of their first rescues was of a male lifesaver. One Sunday a photographer from the Department of Information arrived and took more than 30 pictures. They were then dispatched for publication throughout America and a Movietone Newsreel was distributed to show the women in action. It would take another 40 years before the SLSA would allow women to become lifesavers. They had already notched up one rescue to their credit – ironically of a male lifesaver. In 1944 the Terrigal ladies were on hand again when a shark was spotted close in near the beach. The women lifesavers were rowing the surf boat when they spotted it. Hundreds of surfers were ordered out of the water. The Terrigal women also made history on the Central Coast as the first competitors in their branch Surf Lifesaving competition, as well as providing the first full patrols of women (with an occasional token male). Eight of the original ladies are alive and will attend. Another 11 will be represented on the day by family members. It is not known if another four are still alive. They are Bessie Campbell and (not related) Olive (Dinkie) Campbell, Dot Crick and Noreen Walsh. Terrigal women lifesavers with Bessie Campbell, centre, and directly behind her, Dot Crick, with the towel around her neck. Many young and fit women wanted to serve in WWII but were largely confined to nursing according to Australian War Memorial researcher Emma Campbell. Terrigal surf lifesaver Muriel Dibben, one of several women to receive their bronze medal after 75 years. Mrs Dibben recalled catching the first bus from Gosford every Sunday morning in the summer of 1942/43 to Terrigal where she and the others would perform patrols in hand-sewn uniforms and swimmers. “We would get so sunburnt and then we had a week to get over it and go back again,” she told the Express­ Advocate. Mrs Dibbin, who married Terrigal lifesaver Ron Dibbin in 1943 when he came back from the war on leave, said there was a genuine “fear all the time” of Japanese bombers reaching the Central Coast. “You could hear the (Allied­) planes flying overhead but you would always think it’s not as bad as it was for someone else, or the boys overseas,” she said. When they were not patrolling­ the women were picking fruit for the war effort­ or feeding the “troop trains” who would stop at Gosford station packed with newly enlisted men bound for ships docked in Sydney to take them to Europe, Africa or the South Pacific. “I was riding my bike (to the station) and the chain broke and I went head over heels and split my knee open,” Mrs Dibben said. Of the 72 men who went off to war from the Terrigal area, 70 returned. Of those that died in the war, one joined the army and was lost in the Battle for Singapore, the other, believed to have been engaged to one of the women lifesavers, was in the air force and was shot down over Europe. Terrigal state Liberal MP Adam Crouch will name each woman during a private member’s speech and thank them for their pioneering efforts to not only keep Terrigal Beach safe during the war but pave the way for lifesaving equality. Mr Crouch will also present them with a special Terrigal Parliamentary Award to acknowledge their contribution to the community.